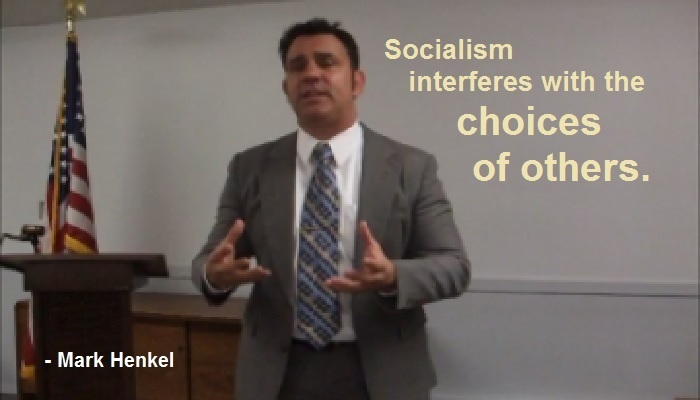 “Socialism interferes with the choices of others. “ I make that important soundbite during my speech, The Anti-Socialist. With every choice we make, we must face the consequences – whether they be good or bad. When we do not take responsibility for our choices, the burden of any negative consequences will inevitably fall onto others instead. When we thereby burden others, we become the direct cause of reducing/harming the range of criteria by which such others may more freely make their own choices. Socialism seductively misleads human beings into thinking that we may supposedly be free to make choices without having to take responsibility for negative consequences. Yet, that allure is a siren song to lead us only to destruction. In truth and in fact, socialism does not actually prevent negative consequences, nor does it prevent responsibility for negative consequences. Rather, socialism merely re-distributes the burdens of those negative consequences onto others. The consequence of that re-distribution of negative consequences is the imposed interference for others to more freely make their own choices. Before such others may determine the criteria by which they would make their own choices, they are first faced with the imposed burden of responsibility of the re-distributed negative consequences. Indeed, the very burden itself of taking responsibility of such re-distributed negative consequences can even hinder, thwart, or outright prevent such others from making the choices they would otherwise choose to make for themselves. As socialism thereby forcefully interferes with the choices of others, it prevents humanity from more freely using the amazing power of choice to accomplish even greater things which we humans could otherwise truly achieve. For that essential reason, I am an Anti-Socialist. As part of the over-arching project to create tools of shareable memes to polygamy activists, the pic for this sound-bite has been posted on Pinterest. Pinterest PIC: Socialism interferes with the choices of others. These three links (one to Youtube and two to Pinterest) are provided as tools for supporters to use when working to persuade and encourage others to allow freedom for polygamists. If you consider yourself a UCAP pro-polygamy activist, the movement needs your help here.